It always feels good to rescue food before it is lost. We used some soft apples in a pie this week and I was glad to get them out of the produce drawer. Apple pie! Yum!!! It’s great you could finish the apples up without throwing them away. It sounds like you’re doing wonderfully using things up. I don’t feel like I’ve put much of a dent in mine. I did bake several of our sweet potatoes tonight, but there are LOTS of winter squash to use yet. Well done to both of you with your improved blood sugar and weight. Thank you. I didn’t think I’d used as much as I did! And, there’s still lots left of many different items that still could use a rotation. It was super funny because my mother-in-law sent home a few different gluten-free flours today with my husband, right after I bought the ones I needed. Thankfully, they are different. Now, I just need to figure out what to do with them because they are not ones I usually use. (Whey powder ideas, anyone?–I guess it’s flour, maybe it’s powdered milk-like, maybe????). Sweet potatoes sound good. I bought a few this week. I’ve never grown them, I think they like more heat than we have. I’ve only used whey powder in smoothies and in a few low carb dessert type items. But what you have may be some type of flour??? The truth be told, I have no idea what I have:). It’s not something I’ve ever used before. I am going to look it up on line today and see what other people use it for. Smoothies and low-carb items sound great. I’ll start looking at those. Whey powder isn’t flour. It is for protein for shakes and such. It is milk based, Hubby is allergic to it so we avoid it in our house. You could put it in smoothies and casseroles. A vegetarian friend sprinkles it in her baked mac n cheese and veggie lasagna. Thank you for the information. Frankly, I’m not finding very much on the internet about it. This is sweet dairy whey powder. Those ideas sound like a good way to use it, especially the smoothies, since we have those quite a bit. So glad your blood sugars are doing better! Congrats to Rod on the continued weight loss. That’s great! Your soup looks delcious. I have a squash I need to use as it seems to be getting wrinkly. I think I will turn it into soup. Good luck with your squash soup! oops I can’t type..Congrats to Rob on the weight loss! No worries:). I’ll let him know that everyone is rooting for him! We finally bought a scale for our house that he can get weighed on, and it’s looking like he’s dropped a few more pounds since his last doctor’s visit. Yea! The best news was at the end of your update – Congrats to you for your sugar levels and to Rob for the continued weight loss. Woot-woot. 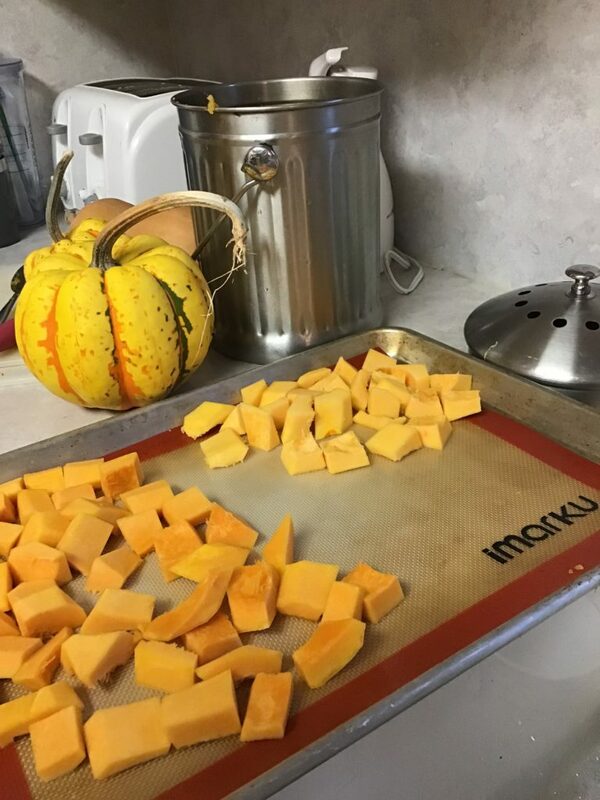 Nice job on your use it up challenge and using those squash. 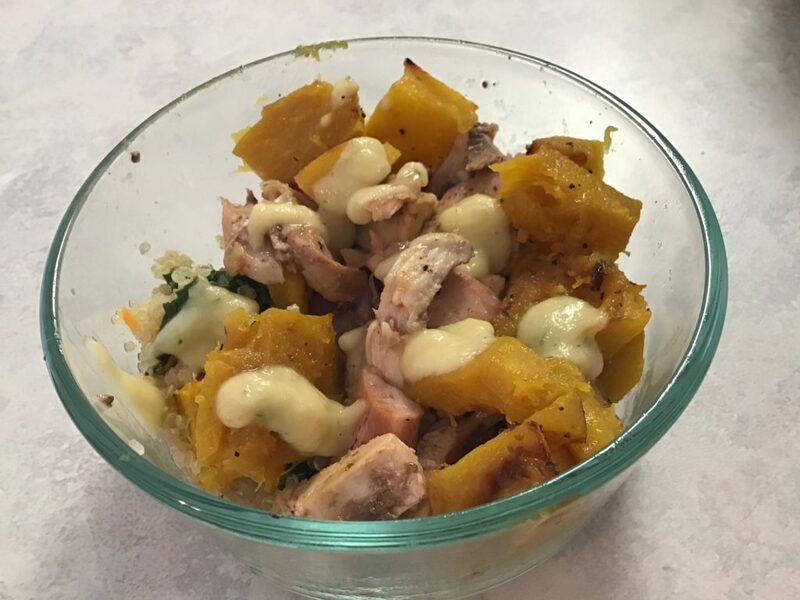 I cooked up all my squash ( butternut, bought on sale not grown by me) and froze up the excess. I have one mini pumpkin that is still holding steady. I’m challenged with this apartment since I don’t have any cool place to store things that’s inside. Missing my former basement and garage. I cleaned out some chicken bones lingering in the freezer and made stock yesterday in my Instant Pot. Then used most of the stock to make split pea soup. Added some pulled pork that was in the freezer to the soup. It came out great. 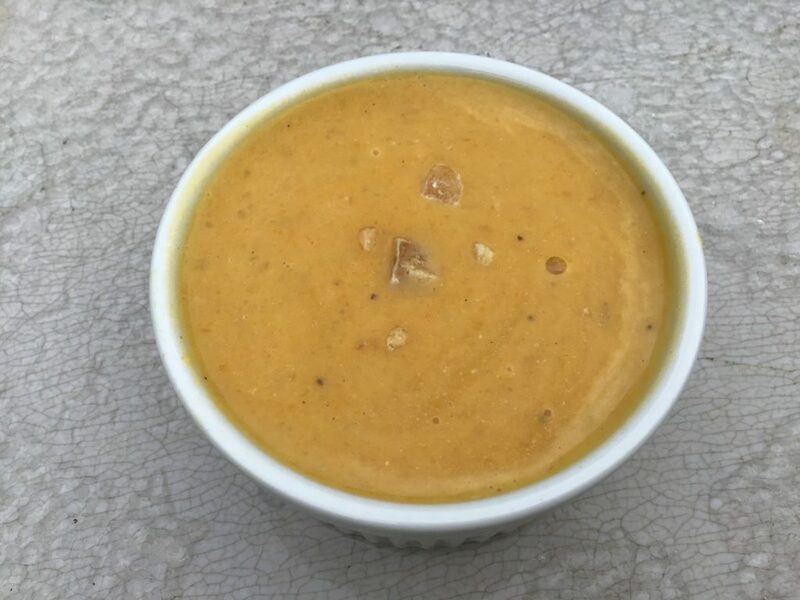 Have to remember to make squash soup next – I have some apples that need to be used and putting them in the soup sounds just the thing. It’s cold here but so far no snow, only hail yesterday. Thank you! It sounds like you did a great job on using things in your freezer. I’m trying to pull something out of mine every day. There are so many things that seem to get lost in mine. Of course, there are tons and tons of fruits and veggies I froze as well, and I want to keep using them up in good ways, especially any that are lingering from previous summers. Good job using items from the pantry. I have also been trying to use up older canned items. I felt like I wasn’t making any progress until I looked behind the laundry room door and saw the mountain of clean canning jars waiting to be carried to the basement. (Way to go me!) 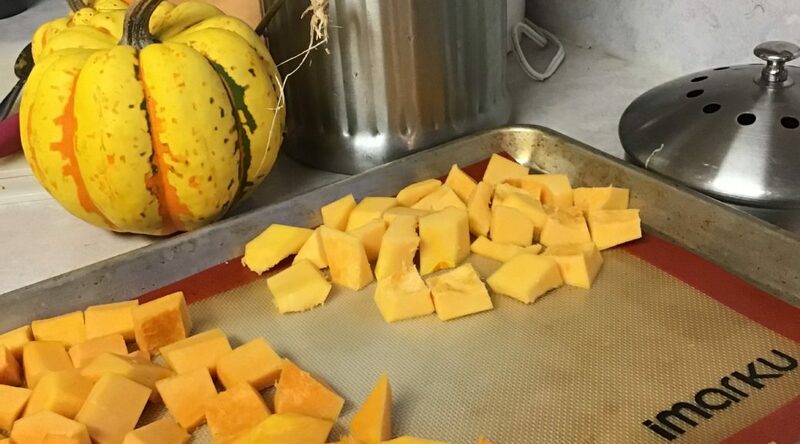 I canned my bumper crop of butternut squash (also grown on my compost pile) from my garden two years ago and had so many I didn’t grow any this past year. Canning worked for long storage but when I do it again I won’t add as much salt as the recipe called for. 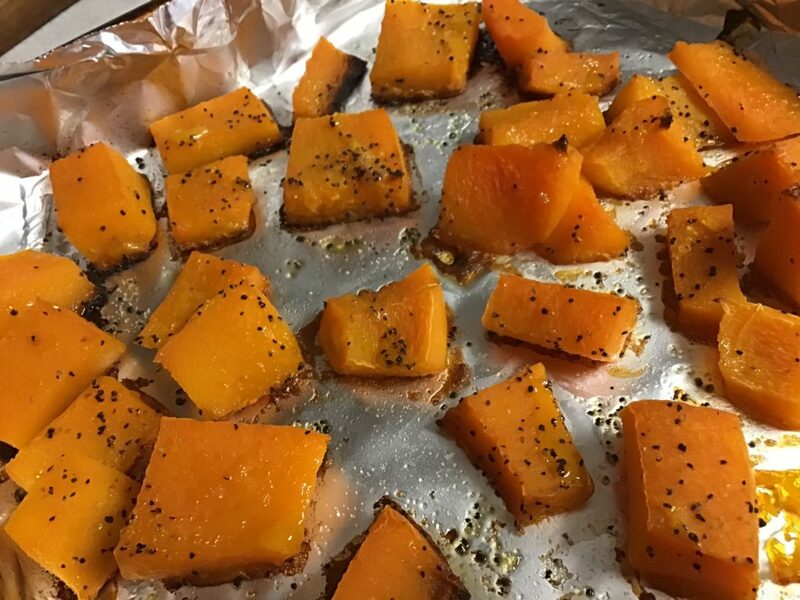 The squash soaked up the salt flavor too much. I’ve never canned squash, but sometime I want to. I always feel great when I take out a basket of jars to the shop where they live. It makes me feel like I’m really making progress on using what I worked so hard to preserve. 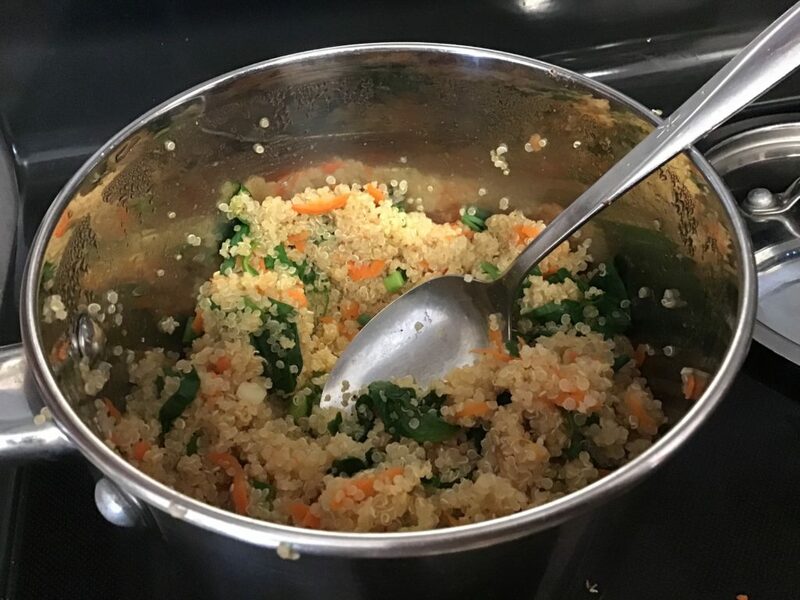 Today I cooked a pot of beans, added dehydrated vegetables from last year’s garden and made cornbread for my husband with corn I had ground from the pantry. I made a smoothie from an expired can of fruit. I am getting inspired by watching you rotate your pantry. It’s great you use your dehydrated veggies. I don’t know why, but I’ve dried things and never used them, in the past. So, I only have a few things I dry and actually use. One is parsley–I use that when I dry it. Another is green onions, of all things. I use those as well, and am out of them right now. Beyond that, I’m just waiting until I really want something to dry any of it, and I hope to eventually find recipes for dried foods that I like, and then I’ll try drying again. It’s a lot of work if I don’t end up using the product! Great job on using everything thing up. I finished cooking my last pumpkin. I froze 8 containers of it. I cooked a 20 pound turkey that I got cheap at Thanksgiving. lots of leftovers so we will enjoy them this week in many different things. I got lots of clearance hand soaps this week so I am stocked up for a while. I saw all those soaps on your blog! WOW! That’s a lot of soap. You won’t have to buy any for a long time, which is awesome. We are getting a turkey out this week as well, and Rob will BBQ it for the upcoming high school retreat. I’m sure I’ll boil the bones since they won’t want to take those on the trip and we will probably eat a bit if it looks like a lot. He will also be cooking 2 hams for them as well. They are expecting a lot of participation, which is amazing. We won’t go ourselves, but my sister and her husband will so she can cook, so we will keep the kids all weekend next weekend. Congratulations on doing so well on keeping your blood sugar under control and on Rob’s continued weight loss! Well done on eating from the pantry and freezer and using up things! It’s good to be able to replenish the used items with new stock, isn’t it? Not sure what whey powder can be used for, but I did read that someone added it to some muffins or something they baked for added nutrition. I am trying to eat low-carb and I am feeling just a bit challenged by it! But, I can really see how my blood sugar levels increase when I eat carbs, so, I am trying to be good! I wish I liked cauliflower, as that is supposed to be a good substitute for rice and potatoes, but I don’t like it that much. I like cauliflower as cauliflower, but not especially as pizza crust or any of that. It does have a distinctive flavor, though, which is why I don’t like it as rice or pizza crust. I just eat less of the carb-filled items. Like, a very small baked potato rather than the big one, or whatever. I just try to stay within the carb guidelines they’ve set me at for each meal, because I have to take insulin. My body doesn’t make any, so I’m working on the ratio of carbs to insulin dose….a little complicated, but it seems to be coming together better lately.